Payment for environmental forest and tree services as an intrinsic part of the stewardship of nature and of the environment, or operated by public and private enterprises, municipalities, communities and individuals representing a wide range of socio-economic and political situations, goes back to the mid-1990s. and bundled services) and benefits which are only apparent. Still, their conclusions are rather tentative: “The markets for the poor have serious difficulties to contend with”, they state. The fact that development specialists tend to stress benefits without systematically taking into account the resulting costs render an analysis doubly difficult. The authors’ arguments show that the ways and means of facilitating access to the new markets for the poor are well known: investing in education and training, supplying them with financial resources and information on market developments, and endowing them with greater formal rights over resource management, control and ownership. A realistic approach to strictly business issues will require the introduction of procedures that comply with current legislation and local strategies, and of funding mechanisms that are as “light” and therefore as cost-effective as possible. Consensual cooperation between the owners and beneficiaries of these services is being implemented, particularly as concerns cost distribution. To exemplify their reasoning the authors cite an interesting case study based on the direct involvement of an international NGO in Guinea’s forest regions. The NGO offers a 5% bonus on the official price for “shaded cocoa”, i.e. cocoa planted beneath a canopy of trees. The aim is to limit the conversion of forest areas to cocoa-growing ones, to produce local wood resources, and to limit the loss of soil fertility. Between 1998–1999, i.e. in just one year, the production of this cocoa doubled (from 650 t). Unfortunately, we do not know how long the subsidies from this NGO will keep flowing. The environmental services market must be innovative. As in past years, however, facilitators must build grass roots capacities and encourage the civil society to participate in official decision-making processes. Also, one must expect the environmental services market to be influenced by existing social and economic conditions, which are still largely inaccessible to the poor and which will not change without voluntary steps being taken by the State, decision-makers and the private sector. Source: Silver bullet or fool’s gold? A global review of the market for forest environmental services and their impacts on the poor. N. Landell-Mills and I. T. Porras. London, IIED, 2002. ISBN 1-899825-92-4. Interactive Problem Solving Workshops - a method for transforming resource conflicts? exchange opinions and develop new, creative ideas. Results can be incorporated into political discussion and thereby help to resolve conflict. IPSWs are not geared to official negotiations, nor can they replace such negotiations. However, Simon Mason’s evaluation of the Nile Basin Dialogue Workshop shows that this method can be extremely helpful when applied to conflicts over natural resources, and was rated highly positive by all parties involved. This working paper focuses primarily on an evaluation of the Nile Basin Dialogue Workshop, 2002. The method is described in more detail in other publications, such as “Transformation of Resource Conflicts” (Bächler, 1999) and “From Resolution to Transformation” (Ropers, 2000). The degradation of grassland has long been regarded as the “tragedy of the commons”. Increasingly, this has led to grassland / rangeland being divided up, with the associated rights distributed among individual households. 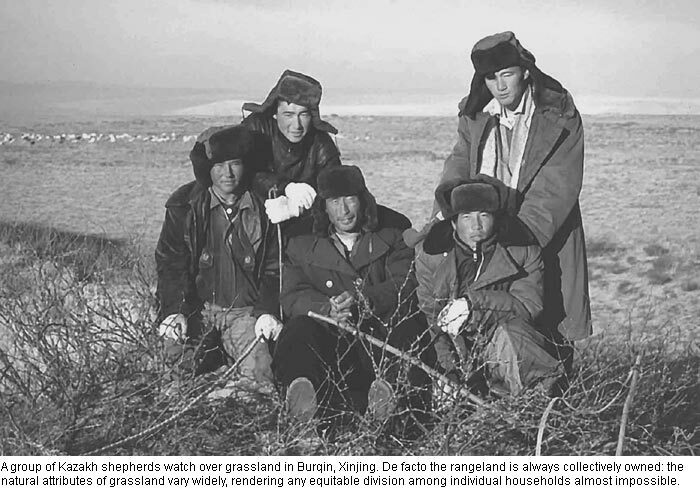 In the wake of the reform movement, rangeland was privatised also in China. This strategy paid little heed to the special attributes of rangeland and its management as opposed to arable land: ecological fragility, uneven access to water, remoteness from residential quarters, difficulties in demarcation, the necessity to determine the optimal size of herds, and others. Innovative experiments in China are now clearly demonstrating the advantages of community-based grassland management over individual grassland management. Among others, the legal prerequisites are an important factor determining the effect of both forms of management on the land. Community-based forms of grassland management (which are to some extent traditional) must be reinforced, improved and formalised in law. in other parts of the world, such as, for example, Central Asia. RISE stands for “Response-Inducing Sustainability Evaluation”, a practical model for assessing the sustainability of farm enterprises. Developed at the Swiss College of Agriculture (SHL) and so far applied in Switzerland, Brazil, China and Canada, the model is based on 12 indicators for the ecological, economic and social situation of a farm. The degree of sustainability is calculated for each indicator, based on its state (current situation) and driving force (tendency). Results are displayed in a sustainability polygon which facilitates the identification of a given farm’s strengths and weaknesses and, by so doing, helps to improve the situation (decision-oriented approach). RISE is internationally applicable to different types of farms and production systems, among others for planning sustainability improvement or for comparative evaluation of farms. The model can be applied to individual farms as well as groups of farms in a specific area, such as catchment areas of processing industries and political or geographical regions. Based on RISE, SHL is currently developing a methodology to assess the sustainability of the entire upstream supply chain of agricultural raw materials to the processing industry. Persons or institutions interested in the application can contact Fritz Häni or Christoph Studer for more details. The Convention on Biological Diversity (CBD) is an ambitious undertaking, one of the first international inter-sectoral agreements since Rio 1992. It is based on three “pillars”: biodiversity conservation, the sustainable management of biodiversity components and an equitable sharing of its benefits. 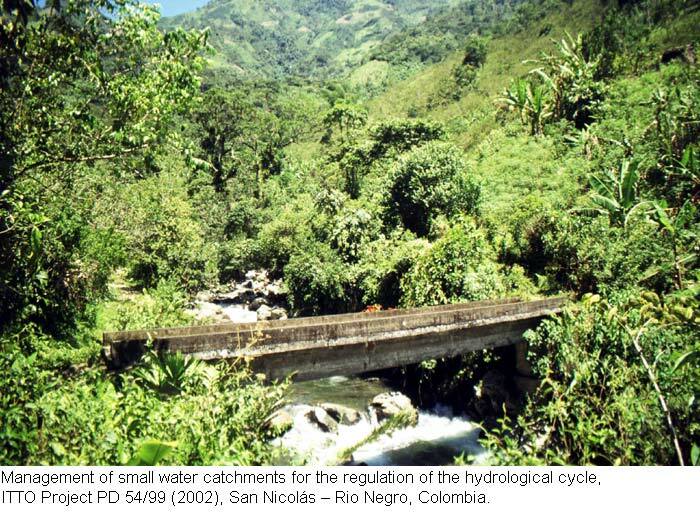 However, in the South, in which most biological diversity is found, the term is often only relevant to international funds involved in resource conservation. Its application is rendered difficult by the complex relations between the economy and conservation issues, and an unequal balance of strength between the different players. The book “Governing Global Biodiversity” contributes political analyses as well as useful descriptions of the mechanisms that have evolved within the CBD. The system of “prior informed consent” applicable to biotechnological deals, for example, is based on a concept from the world of medicine. This stipulates that the patient (targeted by new products) must be informed beforehand by his physician (the industry) of the possible risks of treatment (product launch). Being relatively complex, this compilation will above all be of interest to decision-makers, members of international organisations and students of political and environmental studies. Research, development and conservation specialists and political decisionmakers dealt with this issue at an international conference held in Bonn, Germany in May 2003. The conference opened with a round-table discussion, in which the demands of the participants from the South played a major role. They denounced the attitude of the United States and the general lack of ethical standards in international relations. One speaker insisted upon the fact that, “...forestry policies must be included in national poverty reduction strategies (PRSP). A ‘forester’ must be able to present his Finance Ministry with bundled, comprehensible data likely to promote investment in the development of the poor, notably by means of forest conservation and management”. This, unfortunately, is precisely one of the roots of the problem. Reports on relevant experiences often deal with local conditions only, making it difficult to extrapolate from them and explain them in the light of research. This notwithstanding, conservationists are beginning to use more sophisticated arguments and development specialists are less prone to come up with miracle solutions. Instead, they propose pluridisciplinary processes to be implemented with local communities and other concerned parties. Experts tend to take a more socially-oriented approach and show greater respect for local knowledge. One of the highlights of the “Rio +11: Towards a New Paradigm in Agricultural Research - The Challenge of Sustainable Development” conference held in Zurich in June was the presentation of a project run by the International Maize and Wheat Improvement Center (CIMMYT) that focuses on breeding and farming stress-tolerant maize varieties in southern Africa. Maize varieties grown in test fields were examined to determine their resistance to environmental factors such as drought, low nutritional value and important diseases. Based on the results, promising varieties were bred and subsequently planted and evaluated by farmers. This led to the identification of maize varieties that produce a significantly higher yield and are accepted by farmers. At the same time, solutions for seed marketing were sought in conjunction with local actors. The presentation clearly demonstrated the importance of adapting research to regional parameters and allowing farmers to have a say in the research agenda. 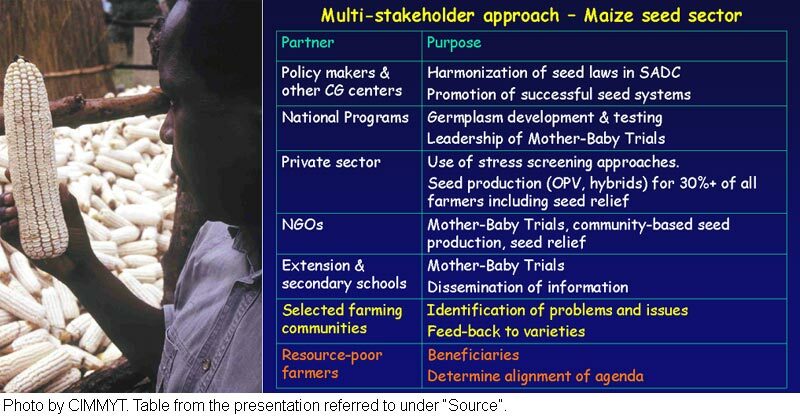 Prompted by the aim of increasing productivity on the farmers’ fields, a relatively simple breeding project evolved to become a multi-stakeholder programme covering the entire maize seed sector. “Plant Journal” recently published a two-part article on this subject which is becoming increasingly topical, particularly for developing countries. The first part of the article provides an informative overview of the countries in which genetically modified (GM) crops are grown, and the extent to which such crops are grown. It also lists the dominant GM crops and discusses legislations regulating the release of GM crops around the world. One particularly interesting aspect examined in the article are the different methods of risk assessment applied in different countries: The U.S.A. favour a product- based form of risk assessment, while Europe bases its assessment on the production process as well as the product. The second part of the article discusses risks and their measurability. The authors are of the opinion that risk assessment should involve scientific methods and that the reference point should always be traditional plant breeding. Based on scientific experiments they conclude that in many cases, the impacts identified for GM crops are similar to the impacts of new cultivars derived by means of traditional breeding. The authors see a certain degree of risk in cross-variety gene transfer. Theoretically there is the possibility that genes with antibiotic resistance could be transferred to harmful pathogens. The study therefore advises against the use of such genes. The forest as a source of life will be the focus of the XIIth World Forestry Congress, to be held in Quebec, Canada on September 21 to 28, 2003. The Congress is organised every six years by the FAO, and is the most important meeting between specialised players and decision-makers in the world forestry arena. Headed by the Swiss Agency for the Environment, Forests and Landscape (SAEFL), ten organisations jointly elaborated the content of the Swiss contribution, which has been entitled “In search of equilibrium”. The Swiss approach to forest use attaches great importance to sustainability and has given rise to a number of projects that should be of interest to other mountainous countries. Switzerland today faces a similar challenge as the rest of the world: how to bring the forest’s social role in line with its economic viability. either intentionally or unintentionally - in areas other than their native habitat. Some plant varieties flourish in their new habitat to the extent that they become problem plants and significantly upset the equilibrium of native ecosystems. For example the water hyacinth, native to South America, has spread so rapidly throughout African lakes and rivers that it is now causing problems such as infestation and clogging of waterways, increased evaporation, and negative impact on the nutritional and oxygen content of the water. An international conference on invasive plants is to be held in Fort Lauderdale (Florida) from 3 to 7 November for scientists and practitioners. Conference topics and themes include: biological weed control, restoring plant communities, ecological impact of invasive plants on native ecosystems, economic evaluation, the benefits of mathematical models, and the role of genetics in the spread of invasive plants.